The No. 45 women’s tennis team will take on No. 17 University of Kentucky this Friday in a regional NCAA tournament match hosted by the University of Michigan. The Big Green ended its season with a strong overall record of 17-4 and a 5-2 record in the Ivy League. This season Dartmouth shared the Ivy title with Harvard University and Cornell University, clinching Ivy League’s automatic NCAA tournament bid by virtue of a complicated tiebreak scenario. The last season the women’s team finished first in the Ivy League was 2011. This is Dartmouth’s second appearance at the NCAA tournament. The team made its NCAA debut in 2015 after receiving an at-large bid. That year, the Big Green downed No. 49 College of William and Mary 4-1 in the first round before falling 4-0 in the second round to No. 2 University of North Carolina. This is the fourth straight NCAA bid for the Wildcats, who play in the Southeastern Conference, perhaps the most competitive women’s tennis conference in the nation. They enter this tournament with a 16-8 record that includes six wins over ranked opponents, notably then-No. 10 and current No. 3 Vanderbilt University. Most recently, Kentucky lost to then-No. 11 University of South Carolina in the Southeastern Conference tournament. Dartmouth played Kentucky at the Intercollegiate Tennis Association kickoff weekend last January, losing 4-1. Dartmouth scored the initial doubles point before losing the next four singles matches. However, one of Dartmouth’s losses was in three sets and the two unfinished singles matches were in their third set. Ng added that it will be key to come out strong in doubles, an area of play which sometimes gave the Big Green trouble in the regular season. Dartmouth went 12-9 in doubles in 2017. Ng also noted that this year’s team is younger than last year’s squad. The current roster has four freshman players. 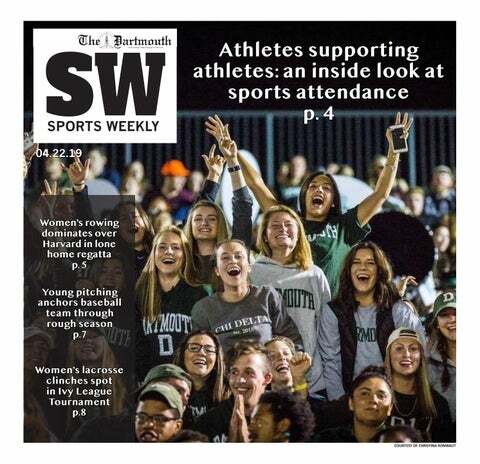 The current women’s team has had one of had one of the program’s best-ever seasons, accumulating the fewest losses for a Dartmouth women’s tennis team since the 2008 squad went 16-4. “This year’s team has definitely felt like a progression — each year we have been improving, and it is great to see everything come together,” Ng said. The tournament will be the last collegiate competition for seniors Ng and Jacqueline Crawford ’17. This is the second NCAA team tournament appearance for both players. Crawford played at the No. 4 spot in the Big Green’s 2015 NCAA run, while Ng was at the No. 1 spot, where she has played every match since her sophomore year. The winner of the Dartmouth-Kentucky match will play the winner of the University of Michigan-Youngstown State University match on Saturday. The winner of that match will move on to play the remainder of the tournament in Athens, Georgia from May 19-23.